And they’re off! Follow along as David and Joanne Genyk of Alberta, Canada attempt to summit Kilimanjaro—Africa’s highest peak. They are having a great time so far and we look forward to their updates. The moment you step foot on the base of Kilimanjaro, at the gates, you will be welcomed by your support team who will be there with you every step of the way until the end of your climb. These guys will amaze you with their work ethic, energy, and endless smiles. Every morning after breakfast, you will grab your daypack and leave your camp. You glance back and see the camp filled with all of the group supplies: tents, tables, chairs, food, duffle bags, and toilets you used the night before. You hike ahead with your group and guide, move towards the next destination. Before you know it, porters are passing you, “Mambo vipi? !”, “Jambo!” they say with a smile; one carrying your duffle bag, one with chairs and one with food—the porters march ahead of your climbing team. Hours later you arrive at your next camp; exhausted, ready to eat and rest. To your amazement, this next camp is set up. You are welcomed with song as your support team gather to sing you all into camp. Your duffle bags are by your tent; the cooking tent radiates smells of the delicious hot meals. 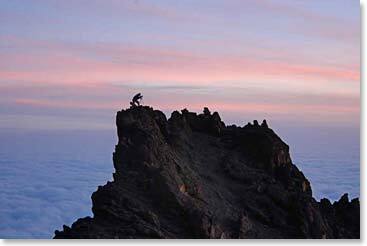 Each day as you move higher and closer to the roof of Africa, the air gets thinner. You feel the toll of multiple hiking days but are able to keep moving forward because your basic needs are met, above and beyond all expectations. The porters and staff who make this all happen do not always receive the treatment and pay they deserve. 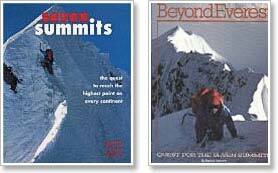 Unfortunately, there are many situations happen on the mountain. Even to this day companies try to make more money by cutting costs, and the ones who directly suffer are the porters. Porters typically do not have contracts with companies, they are either hired days before, or literally at the gates. The money they make on each trip, even if only a couple of trips a year, could pay to feed their families. Not the case for a lot of porters: low wages, or if any kind of payment/tipping (they may never see if the guide decides to pocked it), carrying loads too heavy (more than 20kgs), and/or they do not get the same quality food or decent sleeping accommodations while on the mountain. 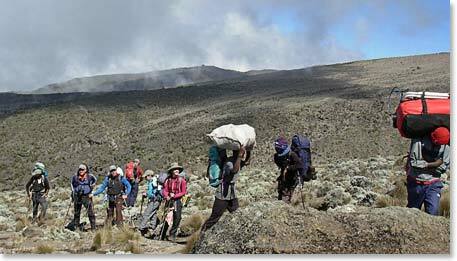 There has been an organization set up (the Kilimanjaro Porters Assistance Project) to ensure that the porters working for companies running expeditions on Kilimanjaro adhere to the fair treatment and pay the applicable amount to the porters they hire. Berg Adventures was recognized by the Porters Assistance Project and IMEC (The International Mountain Explorers Connection), and was listed on the “Partnership for Responsible Travel Program” for our standard of operations and fair treatment of our porters. 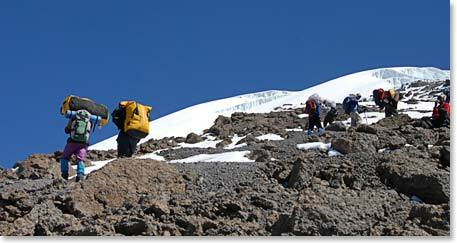 Berg Adventures considers the hard working porters a big and very important part of the team. We believe very strongly in fair treatment and respect for porters and have had the opportunity to hire our core group for multiple trips. When picking a company to climb with, you are hiring the entire operation. It is recommended you do your homework, and ask questions; don’t assume the company will take care of their porters. 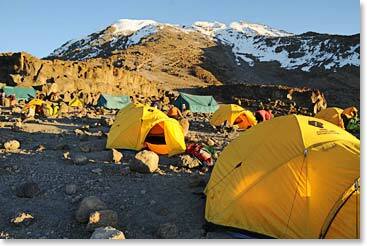 Find out more information on Berg Adventures Kilimanjaro Trips.